Nineteen firefighters who died five years ago when they were overrun by a wildfire in a brush-choked canyon in Arizona were honored Saturday at a memorial service. The event in Prescott featured bell tolls and the reading of the names of the Granite Mountain Hotshots who died June 30, 2013, in Yarnell, northwest of Phoenix. The service in the city of Prescott also included a moment of silence at the time of their deaths. The loss of nearly the entire crew reverberated across the country, becoming the deadliest day for firefighters since the Sept. 11, 2001, terrorist attacks. The Granite Mountain Hotshots were the only such elite firefighting crew tied to a municipal fire department. Over the years, signs of the men have sprung up around the communities they fought to protect. A life-size bronze statue of a wildland firefighter stands at the trailhead of a state park created for them. A plaque near an alligator juniper tells the story of how the crew saved the giant tree. A new learning and tribute center in Prescott features thousands of items that people left outside the crew's fire station after they died, including T-shirts from other U.S. fire departments. Next year, a sculpture of a wildland firefighter with the backdrop of Granite Mountain will be added to the city's courthouse plaza. "While there is no man-made memorial that could fully capture the true essence and spirit of our Granite Mountain Hotshots, I am confident that this memorial will do justice to their legacy and bring healing and hope to the families and our community," Prescott Mayor Greg Mengarelli recently told The Daily Courier newspaper. Some of the men's families started organizations to honor their loved ones. "If anything beautiful has come out of this tragedy, it is that people are being educated about the wildland community, not only the hotshots but smokejumpers, pounders, incident commanders, engine jumpers -- the work they do and the danger they face," Deborah Pfingston, one of the firefighters' mothers, recently told The Arizona Republic. A movie released last year, "Only the Brave," chronicled the wildfire and the men's final moments. Investigators never determined exactly what happened. One investigation found fire officials communicated poorly but followed proper procedure. A second blamed state officials for putting property protection ahead of safety and said crews should have been pulled out earlier. 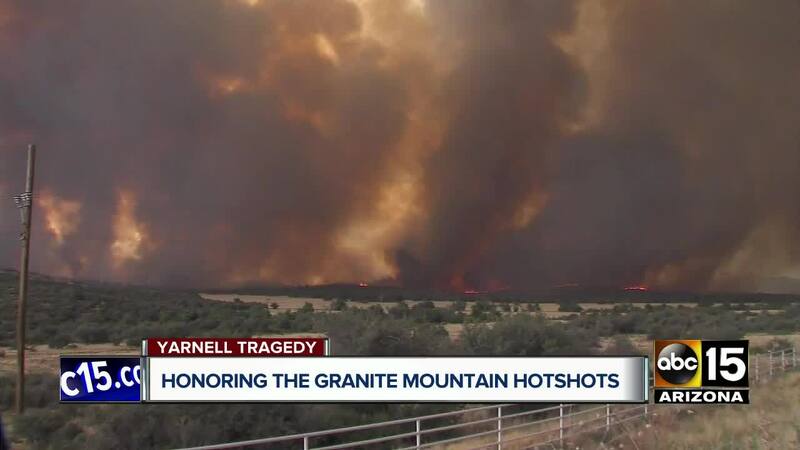 The Granite Mountain Hotshots were on a ridge that already had burned before they moved into a canyon where winds shifted flames in their direction in Yarnell, about 90 miles (145 kilometers) northwest of Phoenix. They deployed fire shelters in a last-ditch effort to save themselves. 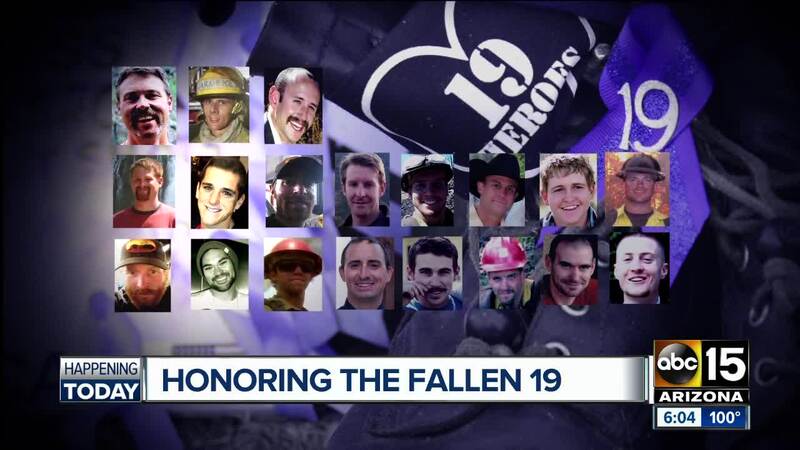 They were: Andrew Ashcraft, 29; Robert Caldwell, 23; Travis Carter, 31; Dustin DeFord, 24; Christopher MacKenzie, 30; Eric Marsh, 43; Grant McKee, 21; Sean Misner, 26; Scott Norris, 28; Wade Parker, 22; John Percin Jr., 24; Anthony Rose, 23; Jesse Steed, 36; Joe Thurston, 32; Travis Turbyfill, 27; William Warneke, 25; Clayton Whitted, 28; Kevin Woyjeck, 21; and Garret Zuppiger, 27. Crosses now mark the spots where fire officials found their bodies. Memorial plaques and interpretive signs at the state park mark the trail leading to the site, surrounded by rock walls and chain link. Only one of the crew members survived -- Brendan McDonough was serving as the lookout in a different location. Prescott decided against rebuilding the crew and later sold the fire station where it was based. The wildfire burned nearly 130 homes.